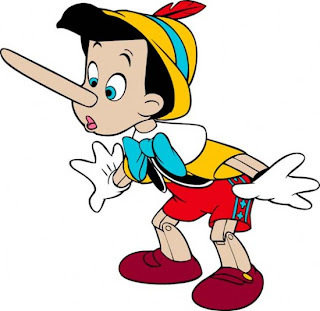 Pinocchio is trying to be economical with the truth, but not completely succeeding because of the Liar Paradox. The Liar Paradox is a statement of the form "this sentence is false." If "this sentence is false" is true, then the sentence is false, which would in turn mean that it is actually true, but this would mean that it is false, and so on in an endless loop. Similarly, if "this sentence is false" is false, then the sentence is true, which would in turn mean that it is actually false, but this would mean that it is true, and so on in an endless loop. So trying to assign a classical binary truth value (0 = FALSE, 1 = TRUE) to this statement leads to a contradiction. Intermediate 'probabilistic' values like 0.5 don't work either. The only way to deal with this problem is for the mind to jump out of the computer-like endless logical loop. This action of 'stepping outside the system' or 'escaping from the loop' occurs repeatedly in different contexts in Buddhist philosophy and practice. TIP - If some aspects of Buddhist beliefs seem unfamiliar, obscure, or confusing, then bear in mind that Buddhism is a process philosophy. Difficult aspects of Buddhism often become much clearer when viewed from a process perspective.